Dated December 31st , 2018. Subject:- Submission of Immovable Property Return (IPR) for the year 2018 (as on 31.12.2018) by the Officers of Central Secretariat Services (088) reg. चुनावी वर्ष में वर्तमान एनडीए सरकार से सातवें वेतन आयोग के अनुशंसाओं में सुधार का इंतजार कर रहे केन्द्रीय कर्मचारियों के लिए यह अच्छी खबर नहीं है. कर्मचारियों की उम्मीदों पर फिर पानी फेरते हुए राज्यसभा में एक प्रश्न के उत्तर में वित्त राज्यमंत्री श्री पी.राधाकृष्णन ने संसद को बताया कि 2.57 का फिटमैंट फैक्टर और हाउस रेंट एलाउंस की वतर्मान प्रतिशतता 7वें केन्द्रीय वेतन आयोग द्वारा की गई विशिष्ट और सुविचारित सिफारिशों पर आधारित है, इसलिए इसमें किसी प्रकार का परिवर्तन परिकल्पित नहीं है. Restructuring of Photographers cadre of Indian Railways - reg. All Indian Railways/Production Units, RDSO & CTIs etc. Sub:- Restructuring of isolated Group ‘C’ cadres - Photographers. Sub: Grant of financial upgradation under MACPS to the staff who are in same Grade Pay for more than 20 years-reg. Ref: (i) NFIR’s PNM Item No. 1/2011. (ii) Action Taken Statement provided to NFIR during its PNM meeting held with the Railway Board on 10/11-05-2018. The ten Central Trade Unions viz., INTUC, AITUC, HMS, CITU, AIUTUC, AICCTU, LPF, UTUC, TUCC and SEWA and also Independent Industrial Federations have declared two day countrywide General Strike on January 8th and 9th in the National Convention of Workers held on September 28th 2018 at Mavalankar Hall, New Delhi. The General Strike Call by the Central Trade Unions, on the following demands, was given in the background of neo-liberal offensives unleashed by the Modi Government against the working people and trade unions and their hard won rights. And Central Public Sector Undertakings and the workers are the worst victims. 1. Refer to Central Organisation, ECHS, letter No 13/49711-NewSmartCard / AG / ECHS dated 31 Aug 2018. Sub: Introduction of SPARROW for completion of APARs in r/o all Group-‘B’ Gazetted officers of DAD. (c) if not, the reasons therefor? (a): Health being a state subject, information pertaining to the doctors doing private practice across the country including West Bengal is not centrally maintained. As per Rule 13 of CHS Rules, 2014, persons appointed to the Central Health Service shall not be allowed private practice of any kind whatsoever including any consultation and laboratory service. In one case reported from Central Government Health Services(CGHS) Delhi, disciplinary proceedings have been initiated against the concerned officer as per rules and procedure of the Government. (b) & (c): As and when any instance of private practice by a Central Health Service doctor is brought to the notice of this Ministry, appropriate action is taken in the matter as per rules and procedure of the Government. Subject :- Departmental proceedings against Government Servants — Procedure for consultation with the Union Public Service Commission – reg. 2. The Proforma / Checklist has been revised in consultation with UPSC so as to ensure that there are no shortcomings while sending the requisite information/ documents to the Commission. It is also expected that the complete reference is received in the Commission at least three months prior to the retirement of the charged officer in case of minor penalty proceedings and at least six months prior to retirement in case of major penalty proceedings in order to get advice of the Commission and the implementation thereof. Wherever the time is less than three months/ six months from the retirement of the Government servant, cogent reasons justifying late submission of case to UPSC are also required to be indicated. 10. (a) Appointing authority in respect of the post held at present, or the authority which actually appointed the person, if that authority is higher. (b) Authority competent to impose the penalty in respect of the post held at present. (c) Appellate authority in respect of the post held at present. 12. Name and designation of Inquiry officer appointed, if any. Order, if any of the competent authority for joint/common proceedings where two or more Govt. servants are involved. i) Charge sheet together with the statement of imputations along with enclosures. * Please indicate references in terms of page numbers, file numbers, folders, etc. Do not leave any column blank. If a document is not enclosed, indicate reasons. A note from the Disciplinary Authority explaining the factual or procedural points, if any, raised in the Charged Officer’s reply in minor penalty cases where no enquiry has been held. Written brief, if any, submitted by the Charged Officer. i) Whether Inquiry Officer’s report provided to the charged officer. ii) Whether disagreement of the Disciplinary Authority, if any, on the report of the Inquiry Officer, communicated to the Charged Officer. iii) Representation of the Charged Officer on the findings of the Inquiry Officer. iv) Para-wise comments of the Disciplinary Authority on the representation of the Charged Officer, if any. i) Whether the case is being submitted at least 90 days prior to the date of retirement. ii) If not, the reasons for late submission of the case may be indicated. i) Whether the case is being submitted at least 180 days prior to the date of retirement. ii) If not, the reasons for late submission of the case may be indiated. Whether the disciplinary authority has considered the merits of the case and come to the conclusion that a formal penalty is called for on the ground of conduct which has led to the conviction of the Government servant on a criminal charge. Comments of the Disciplinary Authority on the Appeal including clarification on procedural points, if any, raised by the Appellant. i) Whether Appeal addressed to the President of India or to some Subordinate authority. ii) Whether the approval of the Competent Authority obtained before referring the Case for Commission’s advice. Note indicating the Reviewing Authority’s findings on the charges, detailing the reasons warranting modification of the penalty already imposed and the extent of such modification. Additional comments on the procedural or factual points, if any, raised in petition. Order of the President*, if any, that the disciplinary proceedings should be instituted under the relevant pension rules. Show cause notice issued to the officer indicating to be made in his pension and the period for which it shall be operative. Reply of the officer to the aforesaid notice. Comments on factual or procedural points raised by the officer in his reply. Approval of the President to the effect that the pensioner is found guilty of grave misconduct or negligence warranting withholding/ withdrawing of pension and/ or gratuity or recovery from a pension or gratuity. *Central Govt. in the case of All India Service Officers. Miscellaneous documents regarding evidence such as the exhibits, statements, etc. referred to in (A) to (E) and extracts of relevant Rules, Codes, Manuals, Acts, Judgements etc. Information/position of disciplinary proceedings instituted against other co-accused officers. Whether complete and up-to-date Confidential Roll of the officer has been enclosed. Details of other disciplinary case(s) instituted against the Government servant and the penalty imposed, if any. Present status of pending court cases, if any, along with the next date of hearing. Ref: Railway Board letter No. 2018/Trans.cell/Health/Medical cards Dated 08.06.2018. Sub: Introduction of SPARROW for completion of APARs in r/o all Group-’B’ Gazetted officers of DAD. Ref: In continuation of this HQrs Office letter of even no dated 13.07.2018. Subject :- Broad banding of disability element in respect of Armed Forces Personnel retired/ discharged on completion of terms of engagement with disability/ aggravated by or attributable to Military Service – Implementation of Court/ AFTs orders. Reference:- This office Circular No. 561 dated 10.06.2016. 7CPC Pension Revision of pre-2016 pensioners - Stagnation increment - Those who retired/died before 1.1.2016 are not eligible for increment after retirement for the purpose of pension. Sub: Procedure for booking of air-tickets on LTC – compliance of instructions regarding. Subject:- Revision of pension in r/o pre-2006 Commissioned Officers/JCOs/ORs Pensioners/ Family pensioners. Reference:- This office Circular No. 588 dated 20.10.2017, Circular No. 590 dated 06.11.2017, Circular No. 595 dated 25.01.2018 & Circular No. 606 dated 24.09.2018. Sub: Creation of posts for new assets - "Pool of Surrendered Posts" – Posts Surrendered due to Work Study Reports. Ref: Railway Board letter No. E(MPP)2010/1/67 dtd. 28/10/2016 (RBE No. 127/2016) and E(MPP)2018/1/1 dtd. 04/04/2018 (RBE No. 52/2018). Subject: Implementation of the recommendations of the Seventh Central Pay Commission - Dress Allowance to officials discharging Prosecution functions on provisional basis. Sub: Railway Services (Revised Pay) Rules, 2016 - opportunity for revision of option to come over to revised pay structure. JR RPF Training Academy etc. Sub: Completion of APARs for the year 2017-18 in SPARROW. Ref: (i) Board’s letters of even number dated 15.03.18, 31.05.2018 and 26.07.18. (iii) Secretary, Railway Board’s letter of even number dated 07.12.18. Sub: Re-engagement of Retired Gazetted Officers in Exigencies of Services_Consideration of re-engagement of retired Senior Scale Officers against Junior Scale vacant posts. Ref: (1) PCPO/CR’s letter no. P/CR/HQ/E-Gaz/274/Re-engangement dated 30.10.2018. (2) Board’s letter No. 2018/Trans Cell/S&T/Contractual Staff dated 25.10.18. 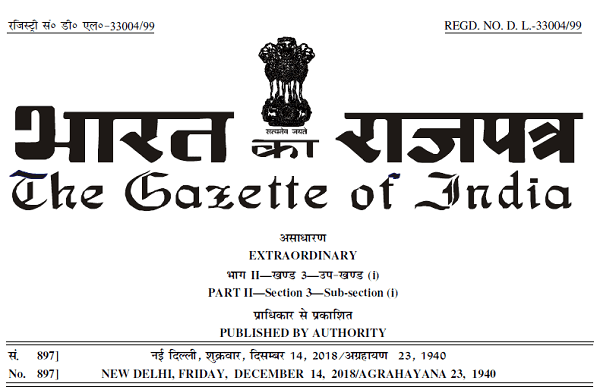 KVS: Grievance Redressal Committee for SCs and STs – reg. DoPT: Standard Forms for intimation/permission under Rule 18 - CCS (Conduct) Rules, 1964 | Transaction of Immovable/ Movable Propert - reg. Subject: Rule 18 of the CCS (Conduct) Rules, 1964- regarding standard forms for intimation/ permission under the rules and expenditure incurred on repairs or minor construction work in respect of immovable property - regarding. 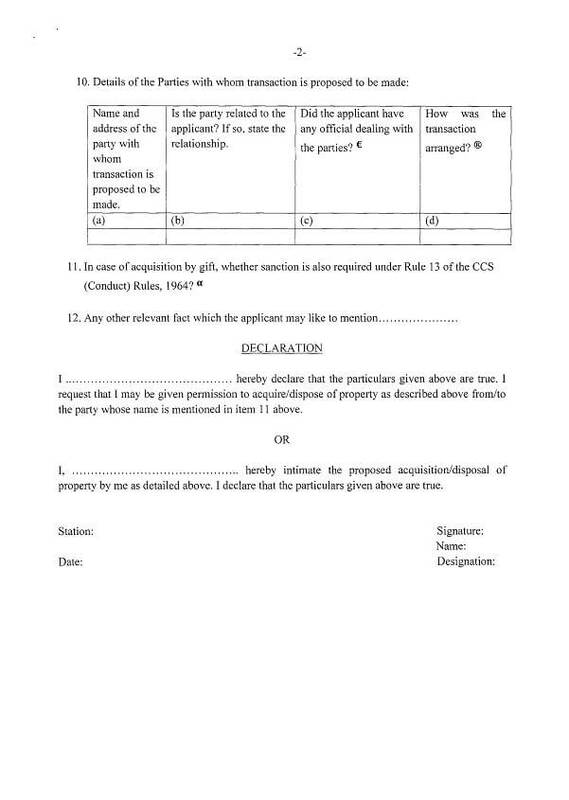 Form for giving prior intimation or seeking previous sanction under Rule 18 (2) of the CCS (Conduct) Rules, 1964 for transaction in respect of immovable property. I ........... .................. . ..... . ...... . . hereby declare that the particulars given above are true. 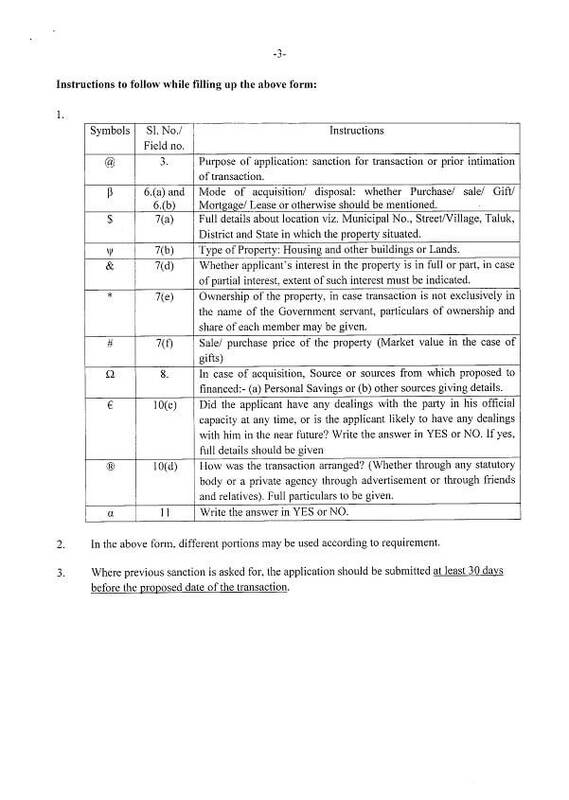 I request that I may be given permission to acquire/dispose of property as described above from/to the party whose name is mentioned in item 11 above. I, ... . . . .... . ... . . ... . . ...... . ..... . .......... hereby intimate the proposed acquisition/disposal of property by me as detailed above. I declare that the particulars given above are true. @ 3. Purpose of application: sanction for transaction or prior intimation of transaction. 6. (b) Mode of acquisition/ disposal: whether Purchase/ sale/ Gift/ Mortgage/ Lease or otherwise should be mentioned. $ 7(a) Full details about location viz. Municipal No., Street/Village, Taluk, District and State in which the property situated. ψ 7(b) Type of Property: Housing and other buildings or Lands. & 7(d) Whether applicant's interest in the property is in full or part, in case of partial interest, extent of such interest must be indicated. * 7(e) Ownership of the property, in case transaction is not exclusively in the name of the Government servant, particulars of ownership and share of each member may be given. Ω 8. In case of acquisition, Source or sources from which proposed to financed:- (a) Personal Savings or (b) other sources giving details. ® 10(d) How was the transaction arranged? (Whether through any statutory body or a private agency through advertisement or through friends and relatives). Full particulars to be given. a 11 Write the answer in YES or NO. 2. In the above form, different portions may be used according to requirement. 3. Where previous sanction is asked for, the application should be submitted at least 30 days before the proposed date of the transaction. 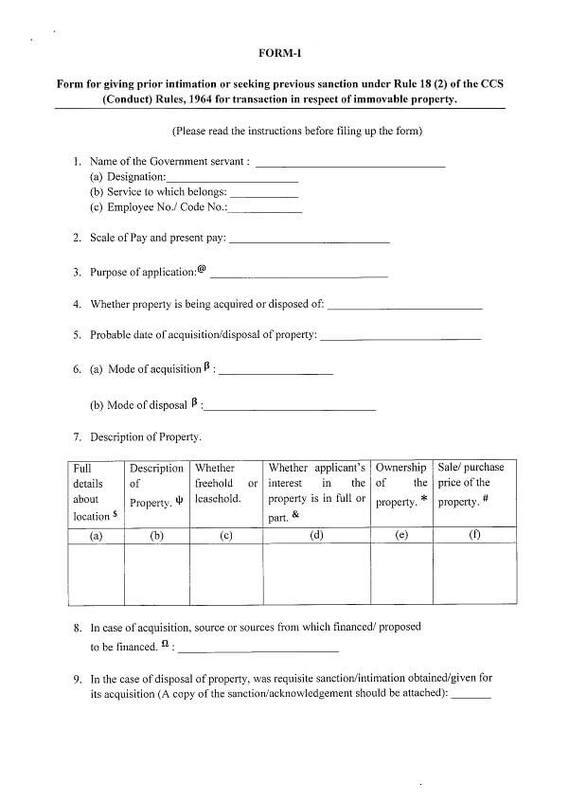 Form for giving intimation or seeking previous sanction under Rule 18 (3) of the CCS (Conduct) Rules, 1964 for transaction in respect of movable property.